Free Cakes for Kids is a community service to families who find it difficult to provide a birthday cake for their child. The cakes are baked by volunteers from across Bristol and South Gloucestershire with your kid’s favourite theme or style. 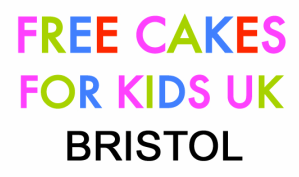 We are part of Free Cakes for Kids UK — the network of Free Cakes for Kids groups in England, Wales, Scotland and Northern Ireland. Our service is always free, friendly and confidential. Need a birthday cake for your child? Take a look at our 'Request a Cake' page and see how you can contact us to request one. Love baking and want to volunteer? Take a look at our 'Get Involved' page and what being a volunteer for Free Cakes For Kids Bristol means. Like the idea and want to support us? Baking is great fun, but does not come completely free and we would be grateful of any support you can offer. Cake boxes, ingredients, organising skills, anything that might make the group run more smoothly. Take a look at our 'Get Involved' page for more information. Want to offer our service to your clients? We work with a number of partner organisations across Bristol but we are always happy to help more. Take a look at the 'Our Partners' page to see who else we work with and contact us to find out more.